Greetings in the Feast of the Dormition of the Mother of God! 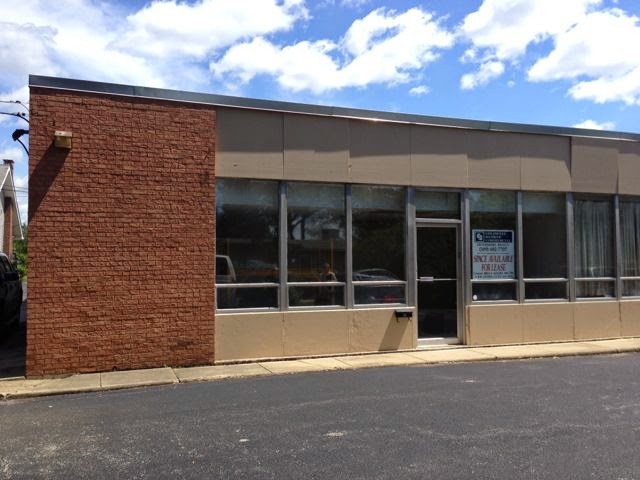 With the blessing of His Grace Bishop Peter we have acquired a lease for a space of our own at 3701 N. Sheridan, Peoria, Illinois. 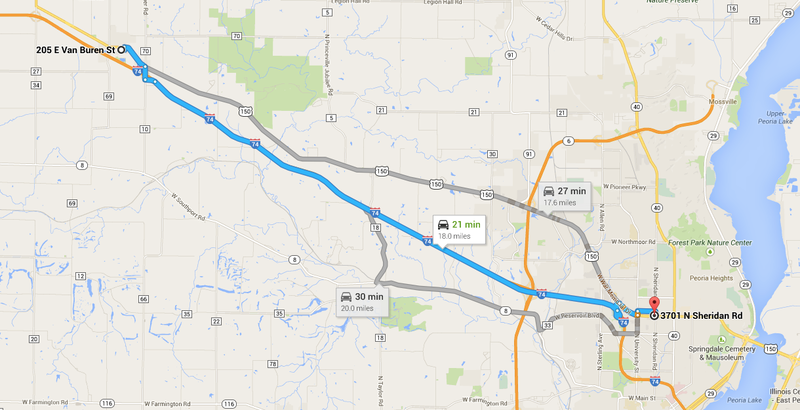 This new location places us right in the center of the Peoria city limits. 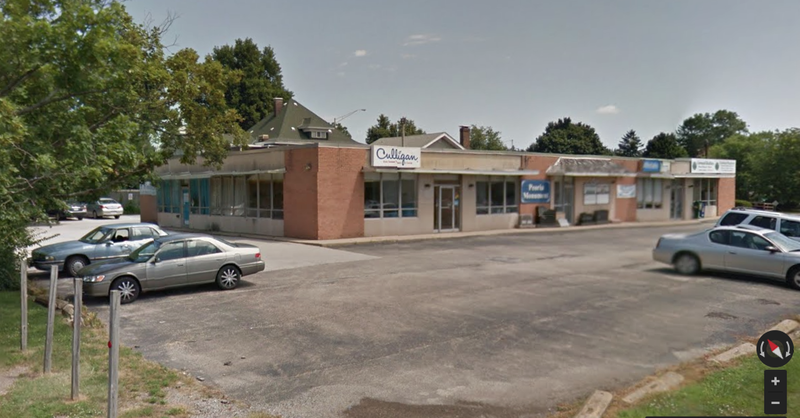 It is ~700 sqft in the rear of a retail/office building (donning blue curtains in the image below). It has plenty of parking and should serve our needs nicely for this next phase of our community's development. This coming weekend (August 30/31, civil) we will hold services at Zion Church in Brimfield for our last time. We are grateful for the hospitality of the community at Zion, Father Thomas, and of the Bishop of the Diocese of Quincy Juan Morales, and the dean Fr. Shawn Doubet. These Anglican Christians in and around Peoria responded immediately and enthusiastically to our earliest introductions, offering the immediate use of their facilities and have joyfully shared their spaces with Holy Transfiguration for our first two years. May they forever be numbered among our "founders and benefactors". Services at the new Peoria location will begin the weekend of September 6-7 (civil). 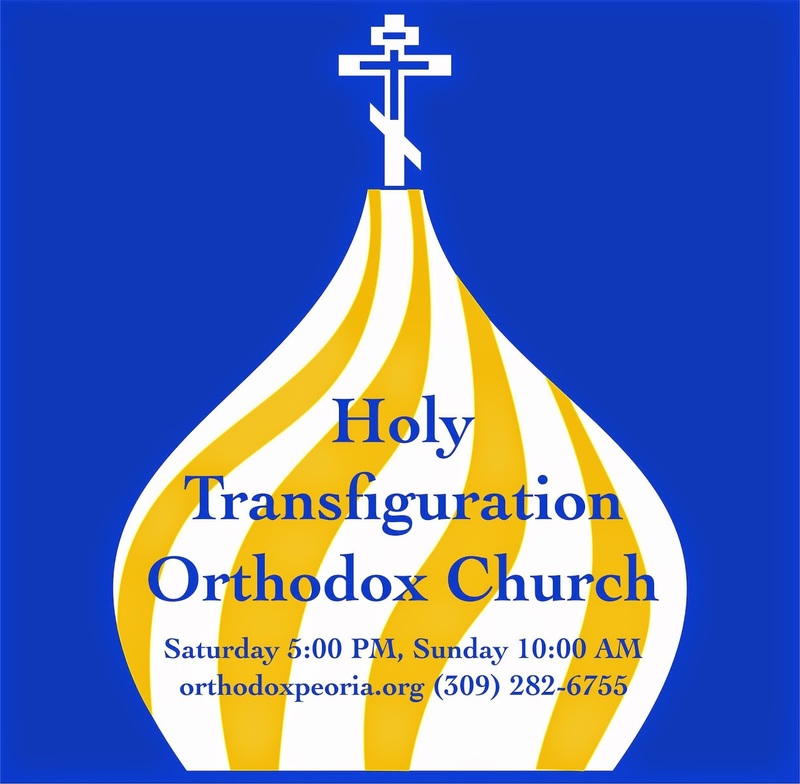 In addition, we will now refer to the mission as our incorporated name, "Holy Transfiguration Orthodox Church" and begin establishing our identity accordingly. 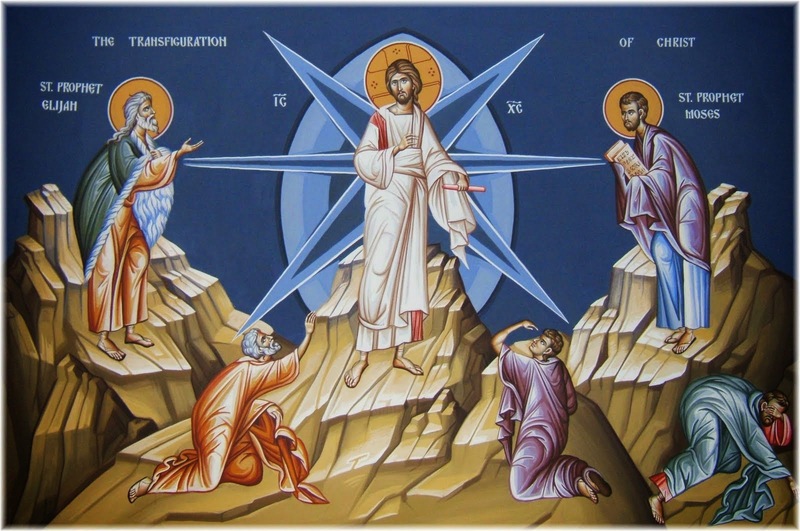 Tonight and Tomorrow morning we celebrate the Transfiguration of the Lord Jesus Christ on Mount Tabor, which is also the patronal feast of our mission. Fr. Joseph Towne will be serving Vigil tonight at 5:30 PM and Divine Liturgy tomorrow morning at 8:00 AM (with hours preceding at 7:40). Being deeply concerned over the situation in eastern Ukraine, where a fratricidal civil war has been going on for already seven months, His Holiness Patriarch Kirill of Moscow and All Russia sent messages to the Primates of the Local Orthodox Churches, asking them to pray for the peace in the Ukrainian land. The Primate of the Russian Orthodox Church also called the heads of the Local Orthodox Churches to raise their voice in defence of Orthodox Christians in the east of Ukraine, who, in a situation of violence on the part of the Greek Catholics and schismatics, live in everyday fear for themselves and their loved ones. Given below is the message to His Holiness Patriarch Bartholomew of Constantinople. I wholeheartedly greet you wishing you peace, blessed physical strength and God’s inexhaustible help in your primatial ministry. I am impelled to address myself to you with this letter by the feeling of profound pain and extreme concern for the situation of our Church’s flock in eastern Ukraine, where a fratricidal civil war has continued for already several months now. As far back as last autumn when the present political crisis in Ukraine just began, representatives of the Greek Catholic Church and schismatic communities, who appeared in the Kiev Maidan, openly preached hatred towards the Orthodox Church, calling to seize Orthodox shrines and to eradicate Orthodoxy from the territory of Ukraine. With the beginning of hostilities, the Uniates and schismatics, having been given arms, under the pretext of antiterrorist operation, began an outright aggression against the clergy of the canonical Ukrainian Orthodox Church in the east of the country. At the same time, the Ukrainian Orthodox Church, unlike the Greek-Catholics and schismatics, remains alien to any political commitment. She continues taking pastoral care of her numerous flock, which includes those who have found themselves on the opposite sides of the conflict, seeking to reconcile them and tirelessly calling them to dialogue. On July 17, 2014, during the Divine Liturgy at the church of the Resurrection in the city of Slavyansk, a group of armed men led by a Greek Catholic military chaplain burst in the church and began threatening the rector of the church, Archpriest Vitaly Vesyoly. A representative of the Ukrainian Greek Catholic Church declared that there was no room in Ukraine for the Moscow Patriarchate and complained that the president of the country did not allow the Uniates to seize the Kiev Laura of the Caves. On July 19, the dean of the Nikolaevsky District of the diocese of Gorlovka, Archpriest Andrey Chicherinda, was insulted and interrogated with handcuffs put on his hands and under the threat of murder. On July 20, near Slavyansk, people armed with submachine guns forced Archpriest Vadim Yablonovsky to dig a grave for himself. On the same day, Archpriest Viktor Stratovich was handcuffed and, with a sack on his head, driven into forest, where he was forced to his knees and interrogated in this position. On July 30, at the Krasnokamenskoe village near Donetsk, a similar group of armed people carried out an illegal search in the house of Archpriest Igor Sergienko, rector of the church of the Holy Prince Alexander Nevsky. The priest was abused, accused of participation in the work of underground organizations, threatened with torture, called to leave the territory of Ukraine and to issue a title to the church fixing the right to the church property. On the same day, at the Amvrosievsky District of Donetsk Region, the Ukrainian military detained Archpriest Yevgeny Podgorny. His hands were tired and with obscenities heaped upon him he was knocked off and beat up and kicked with feet and butts. They shoot over his head, trying to force him into admitting that he helped the militia. The archpriest was forced to put off his priestly cross, but when he refused they tore it off, put him in a pit with a sack on his head and threaten to kill his son. His house was looted. The priest was set free only thanks to the interference of parishioners. We cannot ignore the fact that the conflict in Ukraine has an unambiguous religious cause underlying it. The Uniates and schismatics linked up with them seek to gain the upper hand over the canonical Orthodoxy in Ukraine, while the Ukrainian Orthodox Church continues with patience and courage to take pastoral care of her suffering faithful in this very difficult situation. Most of the clergy who serve in places that have become arenas for hostilities have remained with their flock, sharing with them all the terrors of civil war. Their families are suffering from attacks and lack of water and food and dying under artillery shelling. Thus, on July 31, Archpriest Vladimir Kreslyansky was wounded and later died after a shelling of residential quarters in Lugansk. The priest has left a wife and five children. Eastern Ukraine, a blossoming land inhabited by millions of industrious Orthodox Christians, is turning into a scorched field. The residence of Metropolitan Hilarion of Donetsk and Mariupol has been destroyed by bombing. A bombshell has ruined and burned out the Iveron Convent of the diocese of Donetsk. But despite all these severe conditions, the canonical Ukrainian Orthodox Church, a martyr Church, stays with her flock, doing all that is possible to help people enduring the most terrible times in the modern history of Ukraine. In the fire of civic confrontation, hundreds of thousands of people have lost their homes and become refugees. In fleeing the terrors of war, many of them have found asylum in churches and monasteries, in particular in the Svyatogorsky Laura of the Assumption, which is now overfilled with refugees. In Donetsk, Gorlovka and Lugansk, civilians, in the hope to escape the bombing and shelling, remain in churches overnight, where they receive roof and free food. Other monasteries, parishes, dioceses of the Ukrainian Orthodox Church, too, give aid to refugees and civilians in general. The Moscow Patriarchate as a whole has used all its resources to render humanitarian aid to civilians in the areas where hostilities are going on. In the Russian Orthodox churches, a special daily prayer is lifted up for peace and overcoming of fratricidal strife in Ukraine. The Church has taken care of many thousands of refugees from eastern Ukraine accommodated in tent camps and taken from it to specially prepared facilities in various parts of Russia. Aid is given to all regardless of nationality and faith. Among those who are seeking asylum in Russia are numerous servicemen of the Ukrainian Army who do not wish to shoot at their own people. In these days so hard for the whole Russian Orthodox Church, especially for her faithful in Ukraine, I ask Your Holiness, Most Reverend archpastors, pastors, monastics and all the faithful of the Holy Church of Constantinople to pray for peace in the Ukrainian land, for a end of the bloodshed and for our suffering brothers in the Lord, especially archpastors and pastors who, in this most difficult situation of civic confrontation, continue courageously to do their duty and to carry out their church ministry and to defend Holy Orthodoxy. I would like to ask Your Holiness to use every opportunity for raising your voice in defence of Orthodox Christians in the east of Ukraine, who, in a situation of violence on the part of the Greek Catholics and schismatics, live in everyday fear for themselves and their loved ones, in the fear that if the prosecutors take over, the Orthodox will be forced to renounce their faith or subjected to severe discrimination.